Atlanta, Georgia. 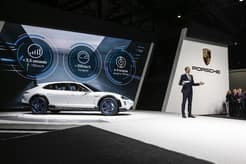 The presentation of the Mission E Cross Turismo from Porsche at the Geneva Motor Show is a concept study of an electrically-powered “Cross-Utility Vehicle.” Designed for individuals with an active lifestyle, the demand-controlled all-wheel drive easily handles varied weather conditions for practical year-round use. The interior offers plenty of cargo space while an exterior mounting system offers a solution for larger items like surfboards or bicycles. The flyline is marked by a sporty roofline that tapers towards the rear, echoing the Panamera Sport Turismo. The dynamic design of the side windows is typical of Porsche style. The broad fenders and three-dimensional sidewalls with air outlets behind the front wheels reinforce the sporty crossover character of the 78.3-inch-wide concept vehicle. Distinctive side skirts with an off-road look and 20-inch wheels with 275/40 R 20 tires are among the vehicle’s other defining features.